scans_daily | After "Metal" there will be "No Justice"
Team Space People - Superman, Starfire, Sinestro, Martian Manhunter and... Starro? 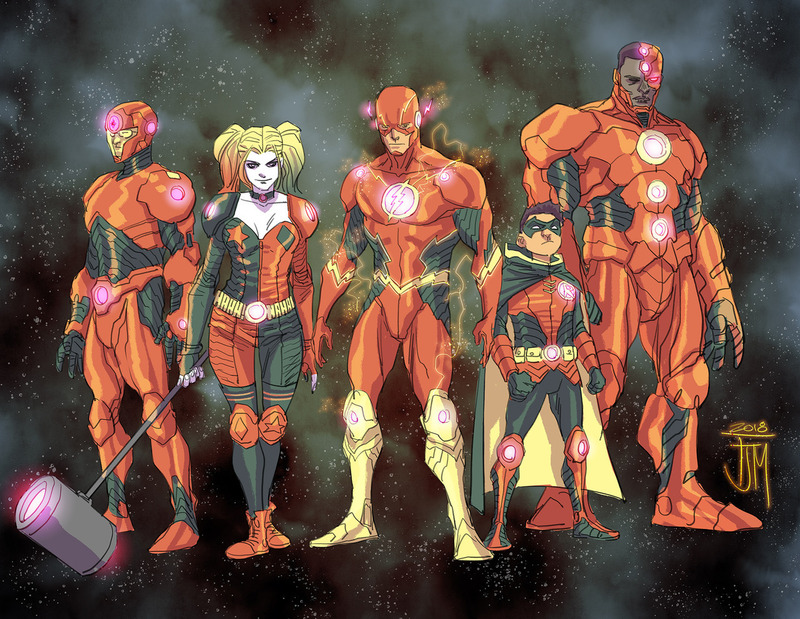 Team Leftovers - Flash, Cyborg, Harley Quinn, Robin and the Atom. Following the events of Metal, which ends on March 14 with Issue #6, there will be a four-issue weekly miniseries that kicks off on May 9 called Justice League: No Justice co-written by Scott Snyder, James Tynion IV, and Joshua Williamson with art by Francis Manapul. Upon concluding, ‘No Justice’ will set the stage for a family of Justice League comics starting in June, with the flagship title being written by Snyder and the others by Tynion, Williamson, and more. No artists have been revealed for any of these titles. Metal, written by Snyder and drawn by Greg Capullo, features the Justice League battling seven evil Batmans who are invading the DC Universe from the Dark Multiverse. 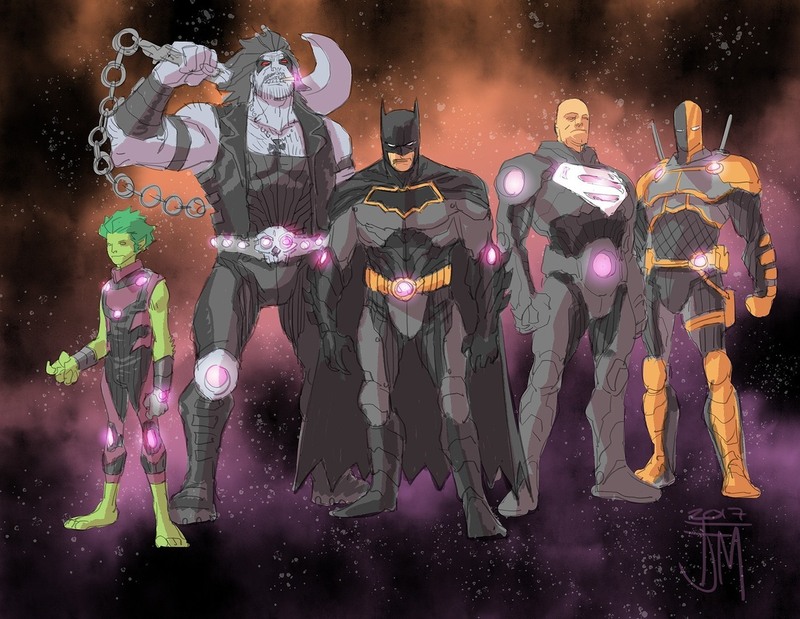 The plot of ‘No Justice’ sees Brainiac warn the Justice League about a cosmic-level threat on the way to destroy Earth. When the heroes find out that even the combined might of the Justice League (including some unlikely new recruits) isn’t enough to stop it, Brainiac advises them with a plan. His strategy involves the heroes allying with villains and splitting up into four specialized teams. The fate of a different alien world depends on the success of each team, but if they fail, it’s game over not just for Earth but the entire DC Universe. Well... the colour coordination is a nice touch? Speaking as someone who likes cosmic stuff, this isn't doing anything. Why did Wonder Woman's team do all their laundry in the same load? I do love Etrigan and Raven's expressions. they don't know who is responsible, but when they find out, they will pay. Oh gods you gave me flashbacks. Yep, keep trying to make Harley Quinn the new fetch, DC, she's totally right behind the Trinity in importance. Harley, Lobo and Deathstroke, all in the same event. Goodness, it's so fetch it's become, like, super-fetch. God Scorntx! Stop trying to make Super-Fetch a thing! It's not going to happen! Yeah, she's crossing into Wolverine territory. Harley Quinn is undeniably hugely popular these days. Nothing fetch about it. I speak as someone who doesn't even care about the character, but it's plain to see. Yeah. I feel... perplexed by the huge amount of whitewashing the character gas gone through (up to just like a couple years ago she gleefully murdered innocent people for the lulz even if the Joker was very far away, these days she is treated like a lovable wacky heroic mascot in child-friendly fiction). But she is one of the extremely few characters my non-comic-reading friends know. They very barely remember the name "Lex Luthor" (really) but they know who Harley is and love her make-up. I believe it may have started around the "Harley Quinn" solo series began. There she was pretty kill-happy at the start. I do wonder if it is because DC Comics overall (and batman in particular) have started to be more colorful again, her raise in popularity (in particular with little girls) because DC doesn't want one of their currently more popular characters be a villain who gleefully kills anyone around him or; as DC has become more willing to showcase that Joker is abusive towards her; she becomes more sympathetic and, as she becomes more sympathetic, writers are less inclined to portray her as a villain. Honestly, looking at the history of the character, the 'murderous fiend' phase was more of an aberration than the times before or after, and it got called out as such when it was happening. When introduced, she was a lovesick patsy for the Joker in the animated series -- amoral and mentally unbalanced, but never murderous, and rarely even malicious. When she was introduced to the comics, she had more of an edge because the comic Joker was worse than the animated series Joker, but still at worst an enabler and a lovable rogue. Then, abruptly (I think it was around the time of the New 52? ), she started mass murdering people, and fans didn't much like that interpretation of the character. So they may have quietly rolled that back with one of the many reboots and relaunches since then. Personally, I disagree. She did try to murder Batman in her very first real episode (IIRC "Harley & Ivy"). Wasn't even in self-defence, he was unconscious and she was ecstatic to drown him in sludge. She tried to kill him again in that episode with the pirhana tank to impress Joker, and later on she tried to kill the Creeper (and ok, Creeper was, well, creeping on her, but she didn't hesitate a second to try and turn him into paste). Then there was Return Of The Joker, where she helps Joker torture Tim into insanity and sounds very happy about the whole thing. Harley was always very willing to kill. Though it's definitely true that the comics turned that up to eleven, especially later on. Starro should be a full-time Leaguer! I am just deliriously happy to see J'onn again. I was so afraid we'd find out Manhattan had killed him. This is like a xerox copy of the Justice LeagueS 5th week event.....that was just recently posted. Huh. This will depend on who's writing what, I suspect, if it wants to keep my attention. Because right now, none of those teams really light my fire, in terms of composition or theme. And what's with all the glowing lights on everyone, anyway? Jim Lee is really in a fan of repeated costume themes, whether they should be there or not. For New 52 it was excess lines and Nehru collars, and now it's apparently glowing lights. Which is, frankly, pretty dumb. Cyborg having glowing lights, sure. Damian sure doesn't need light-up kneepads, though, Wonder Woman loses her 'ancient armor' vibe, and Starro is already a giant starfish - plastering him with lights is just excessive and silly. And does Raven really need Batgirl cosplay? EDIT: Though to answer the question, they're apparently Brainiac-lights, so they probably serve some space function. Are we sure that's Starro and not Shuma-Gorath making a guest appearance from Marvel? So I have to wonder... where are Aquaman and every single Green Lantern who could conceivably show up for this? It's not like Earth doesn't have.... (um, hold on, let me count...) six of them now. Six. Cripes, I remember when Earth had one and a backup. I guess green just doesn't go with any of the above color schemes. Speaking of Green Lantern, does anybody know the current status of Guy Gardner and Ice? I haven't seen anything with them in Rebirth yet. Looking around the DC wikia, Guy Gardner is currently appearing in issues of HAL JORDAN AND THE GREEN LANTERN CORPS. I haven't read it, so I can't say his status quo. Looking at Ice's appearances ( http://showcase.dc.wikia.com/wiki/Category:Tora_Olafsdotter_(Prime_Earth)/Appearances ), the only cover that doesn't say New 52 is GREEN LANTERNS # 9. That was only a non-speaking one-panel appearance in a flashback. Well, the Green Lanterns were always their own color coordinated team. I mean, if you get six GLs together they could pretty much handle anything League level. Maybe Hal convinces then to let Green Arrow join their team since he already matches the color scheme. And Aquaman's team at this point would probably just be the cast of the Aquaman book, doing the sea superhero related stuff they already do there. They'd just need matching orange and green outfits. I'm really excited to see Snyder write Justice League. I thihnk he has shown that he can handle those epic, large scope conflicts while still having a focus on personal dynamics. Justice League of Aliens: Huh. I can't say "everyone is an alien" is a particularly thrilling pitch. Points for the sheer insanity of tossing Starro in there, though. Justice League of A-holes: By far the most interesting to me. If DC is really going to stick with Super-Lex, then a team with THREE manipulative geniuses is an interesting idea, because they're going to be tripping over each other. I assume Lobo is there because they can pay him to punch things. Beast Boy... I guess everyone had to pick a Titan, and they got last pick. Maybe trade him for Damian? 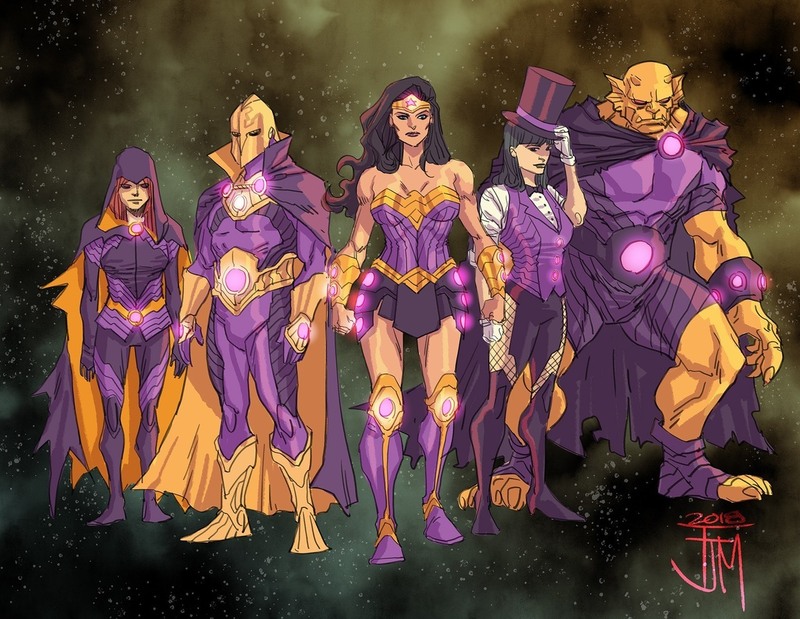 Justice League of Arcane: Look, DC, "everyone's magic" is not a strong enough pitch to build a team around. It didn't work for Shadowpact, and it didn't work for Justice League Dark. But hey, at least it's Diana leading a mostly female team. That's something. Justice League of... Academics? : What the hell, Barry? Okay, you're a science guy, and you recruited fellow science people Atom and Cyborg. So far, so good. Then you grabbed Harley, and buddy, I know she has a PhD, and she's super-popular, but she's not very useful, and she's absolutely going to annoy the serious people - which is everyone else on your team. Finally, you decided on Damian - who is headstrong, won't listen to anyone you have, and has a short temper when it comes to nonsense. Such as Harley nonsense. Three science guys and two loose cannons who will hate each other. Smooth, Barry. Flash really is just king of the leftovers when it comes to these split-up teams, isn't he? First the Justice League of Adventure, and now this. Yeah. Everyone else I can get but the orange one really look pretty random. Wait, that's supposed to be Raven on Diana's team? She looks like Barbara Gordon if Babs had started making poor secret identity choices. But seriously, give it a proper cowl and a bat logo on the chest and that would make a pretty good Batgirl suit. This looks fine, and certainly having Snyder take over JLA makes sense as the next place for DC to put him. That said I feel some kind of way about Priest's run on Justice League being reduced to a glorified fill in. I don't follow DC stuff. At some point New Lobo was phased out for Old Lobo, then? Was it done in a satisfying way? 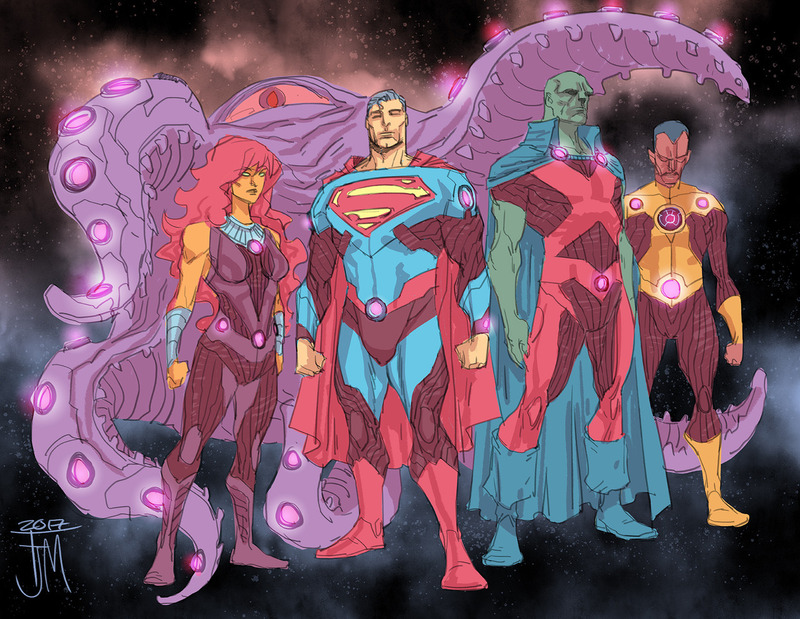 I'm actually most interested in the team with Superman, Starfire, J'onn, Sinestro, and Starro so long as the stories focus on the interplay between their personalities and abilities and not on the fact that they are all aliens (relative to Earth).